Robert Goldfarb joined the faculty in 1973. He received his PhD in Economics from Yale University in 1968, where he was an Assistant Professor from 1968 till 1973. He became Professor Emeritus in 2012. 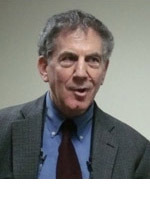 Most of his research and publications through the 1980s were in labor economics, covering such topics as wage and hours determination, geographical wage variation, wage regulation, economic effects of U.S. immigration laws, and labor compensation provisions under legislated deregulation. In the mid-1980s he began pursuing research interests in economic methodology and economics and ethics. Topics here have included: how economists choose assumptions; the status of claims that moral norms should be incorporated in microeconomic modeling of individual behavior; empirical testing of economic theories; problems in drawing inferences from large empirical literatures in economics; methodological issues in economic forecasting; and the relation between economic modeling and empirical work. His other research interest involves applied microeconomics and public policy. Topics here have included: investigating why people choose harmful behaviors, such as smoking or repeated cycles of weight gain and dieting; and the economics of vaccination, of controversial public sculpture, and of nursing shortages. References to specific papers, some downloadable, can be found on RePEc.